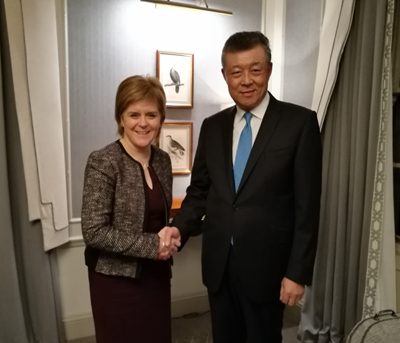 On 2 December, Ambassador Liu Xiaoming who was visiting Scotland met with First Minister of Scotland Nicola Sturgeon. Ambassador Liu said that 2016 had been the first year of the "Golden Era" in China-UK relations, and the bilateral relations had been developing with a sound momentum. In this context, China-Scotland relations continued to develop in a steady manner. Chinese enterprises successively made major decisions over investments and purchases in Scotland, and nearly 40 Chinese art groups put on shows at the Edinburgh International Festival. The next year would mark the 45th anniversary of the establishment of diplomatic relations at ambassadorial level between China and the UK. He hoped that the people from all walks of life in China and Scotland would join hands to strengthen communication and exchange of visits, facilitate economic, trade and people-to-people cooperation, and add lustre to the "Golden Era" of China-UK relations. Sturgeon said that the government and people from all circles in Scotland had been committed to developing relations with China, which would not be affected by the domestic situation in the UK. Scotland is willing to strengthen economic and trade cooperation with China and Scotland welcomes investment from more Chinese enterprises. Meanwhile, she hoped that the two sides may deepen the exchanges and cooperation in culture, tourism, education and other people-to-people sectors.